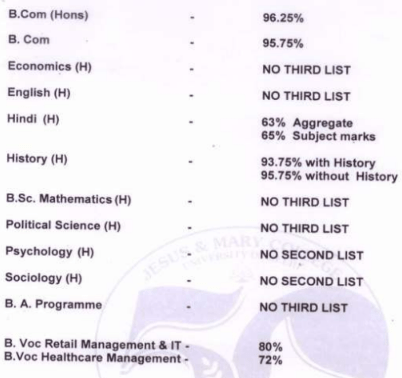 Jesus & Mary College Cut Off 2019: Jesus and Mary College is a women-only college affiliated with the University of Delhi located in New Delhi, India. The college awards bachelor’s degrees in commerce, arts and mathematics. Founded in 1968, it is located in Dhaula Kaun region. Every year it releases cut-off lists for admission to various undergraduate courses on the basis of class 12 marks. 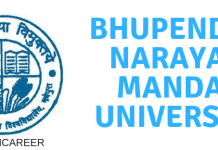 The candidates who meet the JMC cut off 2019 are granted admission to this college. 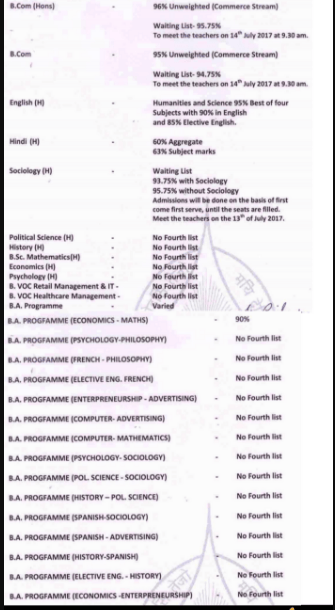 Refer this article to know about the cut-off list for admission to the academic session 2019. The important dates for the admission to Jesus & Mary College will be released in an online mode. Candidates who are planning on applying for the admission to the courses will have to keep themselves updated with the release of the official schedule. It will provide all the important dates and the events of the admission procedure. The candidate will have to keep visiting the website on a regular basis for any of the latest updates. Once the schedule is available, it is advised that the applicant must save and download it so as not to miss any of the dares and the events. The official schedule of Jesus & Mary College will be provided once it is announced by the authorities of the college. Meanwhile, go through the tentative schedule mentioned in the tabular format below. Jesus & Mary College will be releasing the cut off list in an online mode. Candidates who have successfully submitted the Application form will be able to go through the cut off list. It will be important that the applicant must submit the Application Form before the due date. 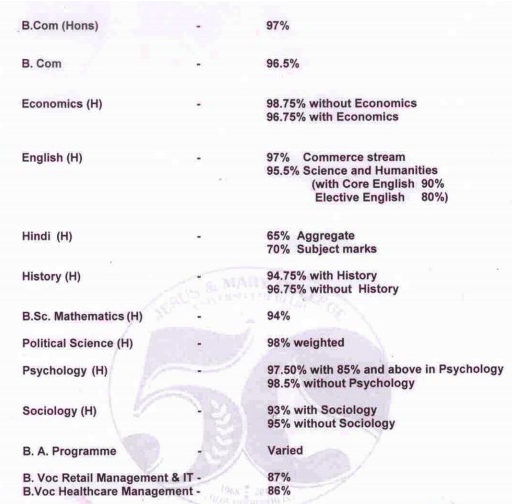 The cut off list will provide the minimum of the marks to be secured by the candidate in their qualifying exam as per the course or the stream. 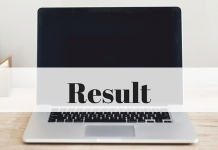 The applicants securing lesser marks than the defined cut off will not be eligible for the admission to the course for which they applied for the admission. The list will mention the cut off marks as per the category. 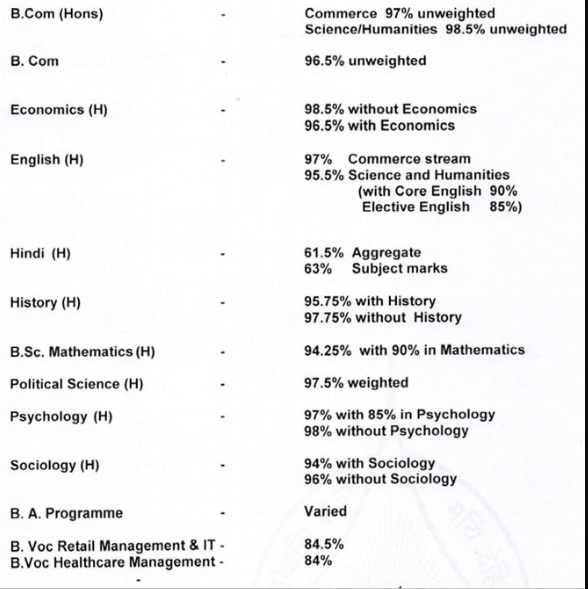 It must be noted that the cut off marks will vary as per the course and the stream based on the difficulty level of the subjects. 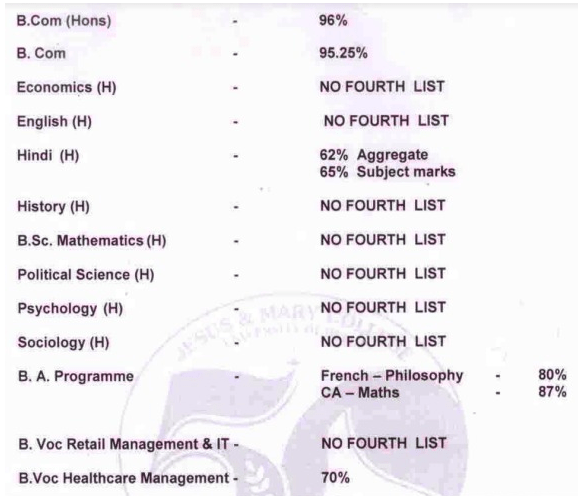 The candidate must have provided the correct information in the Application Form of Jesus & Mary College 2019, specifically the cut off marks, as the information mentioned will cross-checked by the authorities of the college at the time of the final admission. 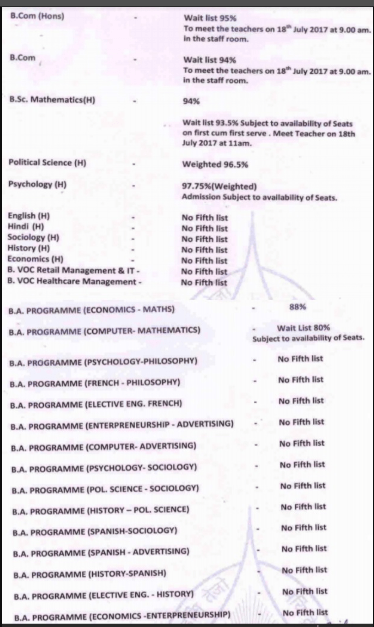 The Applicants can go through the procedure of checking the cut off list of Jesus & Mary College. It is important that the candidate must avoid any form of error while checking the cut off list which will be available in an online mode. Jesus & Mary College Cut Off 2018 Third Cut Off Released!! Jesus & Mary College Cut Off 2018 First Cut Off Released! !